Los Angeles, California, October 25, 2018 — Following the successful launch of her fine art jewelry line, entrepreneur, fine art gallery owner, jewelry designer and devoted mother Viv Storms is giving back. 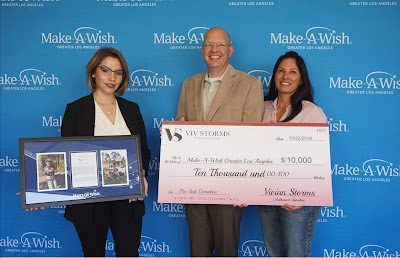 Viv Storms Fine Jewelry is donating 5% of their first month’s sales to Make-A-Wish Greater Los Angeles, helping to grant more life-changing wishes to children with critical illnesses. Thanks to Vivian’s love and unequalled passion and enthusiasm for designing, Viv Storms Fine Jewelry is finally available for pre-sale purchase at a 25% discount through November 30, 2018. For more information, please visit www.vivstorms.com. Founded in 1983, Make-A-Wish Greater Los Angeles creates life-changing wishes for children with critical illnesses. The LA chapter has granted nearly 10,000 wishes to children in Los Angeles County. The chapter grants over 300 wishes each year, and facilitates nearly as many wishes for children from all over the world whose wish is to come to Los Angeles. Make-A-Wish Greater Los Angeles is an independent 501(c)(3) that is part of Make-A-Wish America, a national organization that oversees 62 chapters across the country. Make-A-Wish America is one of the world’s leading children’s charities, serving children in every community in the United States and its territories. For more information, visit www.la.wish.org.